My niece who lives in UK loves to play, sleep with, and cuddle with Lilly the Ladybug from Zoobies. Lilly the Ladybug was my first pick when I saw the selection of Blanket Pet at Zoobies. I tell you, it was a brilliant choice, my niece adored Lilly and it was a big hit for her! She loves it as a toy and enjoys wrapping up with the blanket that came with it whiles lying down on the sofa watching television. The overall feature looks adorable! It is a lovely toy made of polyester material and polystyrene foam beads which also served as a pouch that holds the blanket. The face is stuffed with micro beads and spandex as an outer layer that covers it; making the face feels flabby when you touch it. It was probably one of the good reasons why my niece loves it, as she often squeeze the face then, kisses it! Underneath the ladybug toy is two Velcro straps which can be unfasten to make it as a pillow, and fasten it back to make it as a toy. These can also be used as a handle for carrying the toy because my niece did that when she had it with her when they went out to the park. What I like the most about this blanket pet is the zipped to prevent it from coming out and getting messy. I admit that it was design cleverly and hidden inside the ladybug toy. The blanket is made of soft breathable polyester that has a soft feeling when it touches the skin. I can fully understand why my little niece loves to snuggle under it. Lilly the Ladybug is comfy and surprisingly large enough for a 4 (almost 5) year old girl! I love the fact that Zoobies theme is play, sleep and love, which I noticed and this is what Zoobies has given to my little niece: a toy for playing, a blanket for sleeping, and a pet to love called Lilly. Check out how she got Lilly in this post: HERE. Please visit the Website and I am sure, your child will be as delighted as my niece. You can avail a discount of 20% off when you order any Zoobie product. Such an amazing deal right? Just use the coupon code - Parenthood. 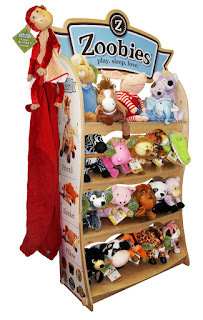 Here's the fun part, Zoobies will be giving away ONE BLANKET PET for one lucky parent out there! (OPEN to US Residents ONLY) It could be YOU! All you have to do is follow the tasks using the Rafflecopter below. Just LIKE, FOLLOW, RETWEET and LEAVE a COMMENT so easy right? GOOD LUCK! AMIABLEAMY.COM is NOT responsible for the giveaway and shipment of the Blanket Pet. The author was NOT compensated for this post. The lucky winner will have to respond within 48 hours or Rafflecopter will pick another winner. Zoobies.com is sponsoring this giveaway and is therefore the company liable for delivery. I would like the frog if i win :-) or maybe a bear! pet blankets suits for kids, they can play with it and at the same time could give them comfort as well. I would love to have the Poco the Pup. Love the color of that blankie. I'm sure your niece was so delighted with that. Wish I win any between Flavio or the Bear.Your niece is indeed adorable. i would like to win Mashaka the MonkeyTM for my son because he doesn't have a blanket with plush toy yet! My kids must love that zoobies pet, since we cant have pet here at home thats a very nice replacement. What a pretty niece you got, Ams! And, I can tell that she enjoys Lilly the ladybug a lot. How nice nga imong gi-send all the way to UK! Generous Aunt kaayo! my girl will surely love to have one of those blanket pets! awwwwwww...she looks so pretty teAmz....liwat kau sa mama! I would love to get the hello kitty for Akesha...that's her latest fave cartoon character these days. if I will win, I want the pony one, my daughter has a huge collection of pony, and she'll be happy if she get the blanket. This is the first time I've heard of Zoobies. That's something I'm sure my daughter will love. It's a perfect Christmas present to give to kids- and maybe even adults. Aww. so cute! Good luck to all the participants in the contest! Lady bug is a friendly creature and a blanket and stuff toy version would surely endear kids. Any design will do as I'm sure my youngest will like it but too bad it is only available for US residents. Great looking blanket. kids will surely love it. You've got such a lovely niece, Ams. She must have loved the blanket so much. These ZOOBIES stuffed toys are very cute and cuddly and by the way, your niece Lily is such a pretty young lady with an adorable smile. :-) Jessica and Marri, Lilly is not my niece :-) Lilly is the name of the Ladybug ... weeee (happy dance) Please join the giveaway coz in the link, you will meet all the blanket pets. Hugs to you both. An all-purpose pet toy, just perfect for kids in terms of play and comfort. I would like to have it for my son but joining the rafflecopter is not for me.dami masyado ng task ,ang haba and it is not worth a time. I will check the price na lang. cute blanket, this a good gift idea.. good luck to those who will join the giveaway..
Forgot to say that your niece is very pretty, the last time I commented hehehe. i like how these manufacturers integrate animal toys with their blankets. indeed they were thinking of the kids comfort. Stuff toys are comfort toys for kids. what an enjoyable way to enjoy bed with this kind of toy.. i bet they are children friendly with their features. Those blankets are perfect for winter! I can't help but notice that little girl's lovely smile! She is so pretty! My daughter doesn't know Lilly the Ladybug! and she loves ladybugs... I will look for downloadables so I can introduce her to my daughter. This giveaway is really cute. If I will win I will give it to my younger son. She is one snug little princess with her Zoobie Pet Blanket. Pretty one too. :) I am still waiting for mine and while I am waiting, might as well join the giveaway. I might not even get mine. hahahaha... :)Kay basin nakalimot ug padala sa akoa. nice giveaway... and a very lovely niece, by the way. love to join, my daughter would surely love the price. Yahweh bless. I would want my daughter to have one. Unfortunately, this is only open to US residents. i love Poco the pup, but I love them all! I want my little boys to have each..but I can only win one, and that is if I do win! Yay!!! I won too! Thank you zoobies and Ms. Amy for my little girl's Christmas present!!! Aww.. your niece looks adorable! She looks really happy with Lilly~ :) Anyway, it's the first time I've heard of Zoobies but I'll definitely take a mental note of it. Maybe I can find something for my godchild from them.